"Henry Danger" and Fighting Bullying! Your new movie "Bixler High Private Eye" is premiering on January 21st on Nickelodeon. What are you excited for your fans to see in this movie? I'm really excited for the fans to see this new character and all of the adventures involved between Xander and Kenzie, played by Ariel Martin. What was it like to shoot this movie with all the adventures Xander goes through? Shooting this film was a different experience for me, since I wasn't only on set as an actor but as an executive producer as well. Working with Ariel was awesome too. What did you learn from the experience of executive producing this movie? Bixler High was my first time working as an executive producer on a project. The fact that it was for Nickelodeon, who has become my family, gave me the confidence to really go for it and jump right in. It was an eye-opening experience to be part of the process in developing a TV movie and to see how many people it takes to create a movie and all the decisions + hard work involved in putting it together. Even though you started working on this movie 2 years ago, it feels like the role is tailored for you and for your age. Is this something you take into consideration now to present yourself in grown-up roles and do this transformation into the next chapter of your career? I love playing roles that I really identify with and as I grow up, I will be looking at roles in the future that showcase my growth as an actor and as a person. As much as I love playing Henry on Henry Danger, it is nice to play a different character and one that I helped develop. Do you think that growing up in the public eye as an actor makes your life any different nowadays? Or did it become all the same since everyone is living a "public" life on social media? I try to be mindful about what I share on my social platforms. I like to not only show the great things that I am doing but the hard work and struggles that come along with achieving my goals. It may seem like I am living a "public" life, but there are times when I chose to shut off from social media and focus on what is going on around me in the moment. What would you say is the best thing about having this extra voice on social media that actors didn't have 10-15 years ago? I think it's amazing, because fans get to see the real side of us that they didn't really have the chance to before. Like, they get to know what I'm passionate about and what my life looks like outside of glamorous sets and photo shoots. It's also amazing to be able to bring awareness to issues I believe in and to help support my fans on their journeys as well. You're connecting brands with influencers on social media through your company "Creator Edge Media". What did inspire you to branch into this business? I was seeing so many of my friends and colleagues connecting in partnerships that they didn't really believe in, or companies not utilizing partnerships with influencer in the most productive ways. I really wanted to make a change and maximize the effect that influencer partnerships could have. This way both the influencer and the brands are happy and proud of what they're promoting. With the huge amount of people wanting to become influencers on social media, how do you define an influencer? And is everyone qualified to become one? I think an influencer is someone who uses their voice to make an impact in multiple ways. Anyone can be an influencer, but hopefully those who become successful use their voice for good and make positive a change in the world. "Henry Danger" is back on Nickelodeon as well! What can you tell us about this new season? The new season is awesome. Everyone was stoked to be back on set, and we are making some really cool episodes that I think fans of the show are going to love. There's definitely more crime fighting going down for Captain Man and Kid Danger. Is there a specific episode that you can't wait for your fans to watch? We have a three-part episode airing later this month where Kid Danger has his powers stolen by a criminal and his identity is revealed. The whole team works together to save Swellview and I know the fans are going to love it! The series just passed its 100th episode. How do you feel about being on Nickelodeon's longest running series? It's such an honor. Nickelodeon has some legendary shows that I grew up watching and to be part of history as Nickelodeon's longest live action sitcom, is a great feeling. What do you think keeps this show going strong since 5 years? It is a really fun show, with strong characters and the writing is hilarious. I think it is a show that allows parents to view and enjoy it with their kids. Captain Man and Kid Danger are always going on crazy adventures, and the writing keeps every episode interesting. What do you think should be the next step for "Henry Danger"? It would be awesome to film a "Henry Danger" movie. There have been some talks about it but no decisions have been made yet. You've been very vocal about bullying. Do you think that things are changing since this subject has got a lot of attention in the last few years? Yeah, I definitely think so. With the attention and awareness about bullying through social media, I think kids are starting to speak up and not be embarrassed or afraid. I know I was afraid to say anything when I was a kid, and I wish I could have seen some of my role models be open about their problems with bullying. Many people who suffer from bullying are afraid to speak up. What was the turning point for you that made you decide to talk and stand up for yourself and for many others? I have ADHD and dyslexia and as a kid it always felt like something that needed to be kept quiet and I was embarrassed about, especially in school. As I got older I realized that there are tons of kids with the same problems I have, who have to deal with bullies and feeling like they don't fit in. I just wanted those kids to know that they aren't alone and they can become successful and follow their dreams regardless of what bullies say. I wanted them to know that there are people who are and will always be there for them. I had my own battle with bullying when I was 15, but back then I had to stand up for myself on my own, because no one in the media was talking about this, and it "wasn't a thing". Looking at how things have changed gives hope to a lot of people out there. What do you think today's generation has to do? What is the next step to end bullying? I think it is essential for people to continue to have open conversations about the seriousness of bullying. It's important that everyone weighs in to show kids that are being bullied that it does get better and it will pass. You're very open about your battle with dyslexia as well. What would you say is the biggest misconception about dyslexia? From what I've encountered, people look at dyslexia as a big disadvantage where you're unable to pursue your dreams or have a successful career, but honestly people with dyslexia become really hard workers at a really young age and I found the determination to succeed because of people saying I can't or that it will be too hard for me. Was there any point where you thought this might stand between you and your dreams? I mean, as a kid in school it was hard, and being told things are going to be hard forever was challenging, but it's your life and you just have to learn to push through and follow your dreams, because the only person who is going to stop you is you. You've fulfilled your dream as an actor so early in life. What was your biggest motivation to get there? Honestly, once I got started I didn't want to stop. And that still continues today, I have so much that I want to accomplish not just with acting. My biggest motivation is to keep grinding and believing in myself. Whose acting career do you look up to? Where do you see yourself five years from now? Leonardo DiCaprio. He was so talented at such a young age, and I would love to follow his footsteps as an actor. Five years from now I hope to still be acting and producing. Who would be your dream co-star? I know you're already working on some upcoming projects! What can you tell us about them? Yes, definitely. Aside from Bixler High and Henry Danger I've been working on producing and developing a few other cool TV projects. Once I can share more details, I definitely will. Tell me one thing your fans don't know about you yet! Ah man, I am pretty open with my fans. I like to not only share my achievements and growth but struggles I have had along the way with them. 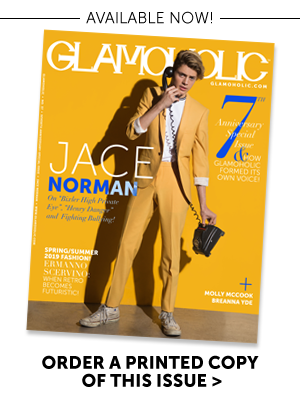 This story is featured in Glamoholic Magazine's Seventh Anniversary-Special Issue (#37). 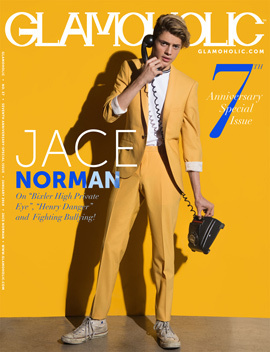 Click here to order a printed copy of this issue. "IT WOULD BE AWESOME TO FILM A HENRY DANGER MOVIE!" Glamoholic © 2019. Created By Bashar Zidane.